As a part of a optional semester project various image denoising algorithms, based on successful total-variation denoising, were studied. The goal of the project was to develop efficient image denoising techniques when multiple noisy acquisitions of the same image are available. This situation is common in fluorescence microscopy. As part of the project MATLAB code was developed, which is capable of denoising images corrupted with various types of common noise encountered in fluorescence microscopy. The algorithms used are variations of total variation denoising models with three types of data-fidelity terms: L2, L1, and Poisson. The algorithms work on multiple noisy acquisitions of the same frame and can be tested on three types of noise: Gaussian, Salt & Pepper, and Poisson. 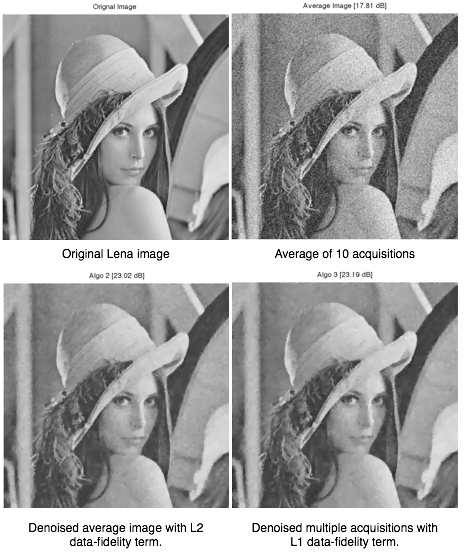 Images below present examples of applying the algorithms on 10 acquisitions of Lena image corrupted by centered AWGN of variance 0.05.